Like millions of other politically-conscious Americans (and bored Canadians), I watched the one-and-only vice presidential debate on Thursday night ... the only difference is that I watched it from 35,000 feet in the air while flying from an extremely liberal blue state to a hard-core conservative red one. My plan was to order a cocktail to drown my political sorrows, but JetBlue liquor is overpriced, so instead I mourned my inevitable self-imposed exile to Canada - sober. 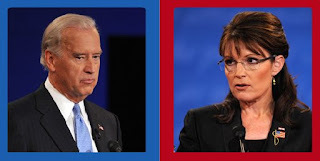 Like millions of liberally-minded Americans (and bored Canadians), I watched the debate, hoping to see a major f*ck up from the Republican candidate, Governor Sarah Palin, but alas, the gaffes weren't great. As a general rule, I try to avoid watching politicians because of the vomit-factor, preferring to selectively read the highlights on Yahoo, but this night I stomached Gov. 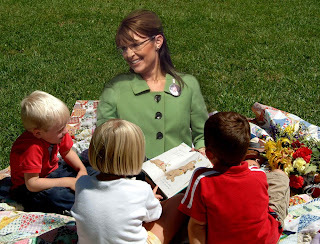 Palin's maverick-y catchphrases and rehearsed rhetoric, and I wasn't appalled. I think the thinning atmosphere must have been working havoc on my nervous system because I wasn't nearly as terrified of her ideologies as I usually am. As the governor skillfully avoided answering any questions, I couldn't help but think that, huh, this lady's actually kind of charming in an unpolished, folksy way. If this politics thing doesn't work out, she could probably make a living as a voiceover artist for children's books. With her cheerful twang, she sounds as harmless as Storybook Lady at the Wasilla Public Library, reading fairy tale classics aloud between the hours of 2 and 3 pm. Kids are gonna love her. And then as we began to descend, I came to my senses. She wouldn't do well as Storybook Lady at all. Too many books would need to be banned or burned. And the older kids might get annoyed when she deviated from the print, preferring to speak directly to the children without actually reading the story at all. And then the whole system would really be in trouble if Storybook Lady were to insist that she's in charge of the library, not merely a ceremonial figurehead called upon only when a tie-breaking vote is needed to determine whether or not late fines should be increased from a nickel-a-day to a quarter. Storybook Hour would be ruined for everyone. Maybe she should keep the day job after all.